An extraordinary mobilization of support for abortion access in Texas last week has stimulated the imagination of reproductive justice activists everywhere. 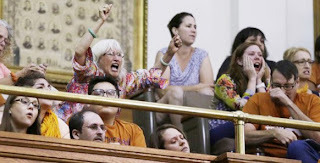 On June 25-26, close to 200,000 people around the country stayed up past 4 a.m. to watch the livestream of Texas State Senator Wendy Davis wrapping up an 11-hour filibuster that effectively, if temporarily, killed Senate Bill 5. The bill, which banned abortions in the state after 20 weeks, also legislated unnecessary and expensive improvements to existing clinics and was designed to lead to the shuttering of all but five of the state’s 42 abortion clinics in a state 773 miles wide and 790 miles long. While most mainstream news and blog commentary has focused on the heroism of Davis—whose pink Mizuno sneakers have become an internet meme—it is the images of chanting feminist protesters filling the gallery and the balconies of the rotunda of the state capitol building that are thrilling veterans of the original fight that culminated in the landmark Roe v. Wade victory in 1973. The nearly 2000 demonstrators of all ages who were mobilized inside the legislative building filled the space with the sound of resistance to the lawmakers’ attempt to turn back the clock, and the spectacle was unquestionably reminiscent of the historic demonstrations in Wisconsin and Ohio against union-busting in 2011. While the mobilizations in Texas have not come anywhere close in size to the mammoth protests of tens of thousands two years ago, the fact that there was an echo of those historic mass actions has placed this tactic on the agenda for the movement nationally. Texas activist Jessica Luther, writing on the “Feministing” blog on June 28, explained that the Senate filibuster supporters’ mobilizations came after an earlier protest in which 700 showed up at House hearings to tell their abortion stories and after 1000 appeared to protest the House vote. The question now is whether or not activists who know that the Democratic Party cannot be relied upon to secure reproductive justice will be able to seize on this opening and begin the process of putting young women into the streets on a regular basis. The test begins on Monday, July 1, when right-wing Texas Governor Rick Perry opens a second special 30-day session of the legislature called specifically to pass the bill just sandbagged by the Davis filibuster. At the 43rd National Right to Life convention in Dallas on June 27, Perry upset party regulars by crudely calling out Senator Wendy Davis as a single mother and daughter of a single mother who should know that every “life” matters, but he successfully rallied the right for the coming confrontations. The showdown unfolding in Texas is a challenge to feminist activists nationwide. Will the effort expended by women from every part of the state to build the recent actions be the beginning of massive mobilizations capable of pushing the War on Women, or will this explosion of militancy be subsumed by a Davis run for governor on the Democratic party platform and calls for more women to run for office? In lieu of a call for a national action in Dallas, the call by WORD and other organizations for solidarity actions around the country are certainly steps in the right direction. Already Ohioans, inspired by the Texas women, have called a protest to take on a similarly restrictive bill pending in their own legislature. To be effective, these calls for action need to emanate from ad hoc coalitions involving both mainstream reproductive justice organizations and activist formations of young women, women of color, and the female immigrants leading so many movements for social change. The situation certainly demands action. According to Katie Glueck writing for Politico, “Nearly a dozen states have passed 20-week bans on most abortions, and they have gone into effect in seven states.” In addition, the U.S. House of Representatives recently passed a 20-week fetal pain bill, although it’s unlikely to get a vote in the Democratic-led Senate. All of these bills challenge Roe v. Wade and have been introduced to provide the Supreme Court the opportunity to reverse that historic decision. > The article above was written by Christie Marie of Socialist Action newspaper.